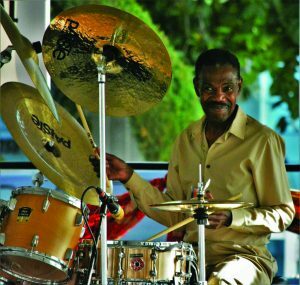 My best friend, Ndugu Chancler, was one of only a hand full of drummers who could be recognized by a single name: Ndugu. His moniker was well deserved and well earned. He stood tall among the genre of drummers who spring up… and he stood atop most of them. “He was one of the cats who became famous and never forgot where he came from,” so says King Errisson… not one to offer kudos easily. I can attest to his greatness as a musician and friend. I faltered once and only five beats passed before he picked up the drum sticks and played as though he wrote the song. Another of his talents: “Let It Whip,” a hit from his pen… “Billy Jean,” from his steady bass drum line to the funk that followed. He was known all over the world by many. An astute musician/politician he called me every morning no matter where he was… Yes… he was my caretaker. His sticks reached nearly 3,000 people in attendance at his celebration of life, further evidence to his impact as a leader. I kiddingly suggested he run for politics… he was that well-known and well-Liked. I will miss my best friend… miss his playing and his love… for all mankind. R.I.P.